The Soccer Stadium Lying On Two Hemispheres…. This Friday, two local Brazilian football clubs—Santos FC and Macapá—will face each other at the Estádio Milton Corrêa, a multi-purpose stadium in the city of Macapá, Brazil. When the whistle blows at 5:00 PM local time, each team will defend the goal on their side. But that’s not the only thing they will be defending. Estádio Milton Corrêa is the most centrally located stadium anywhere in the world. It straddles right over the equator. In fact, it’s so precisely built that the mid-field line coincides exactly with the equator line, so that each half of the field lies on a different hemisphere. 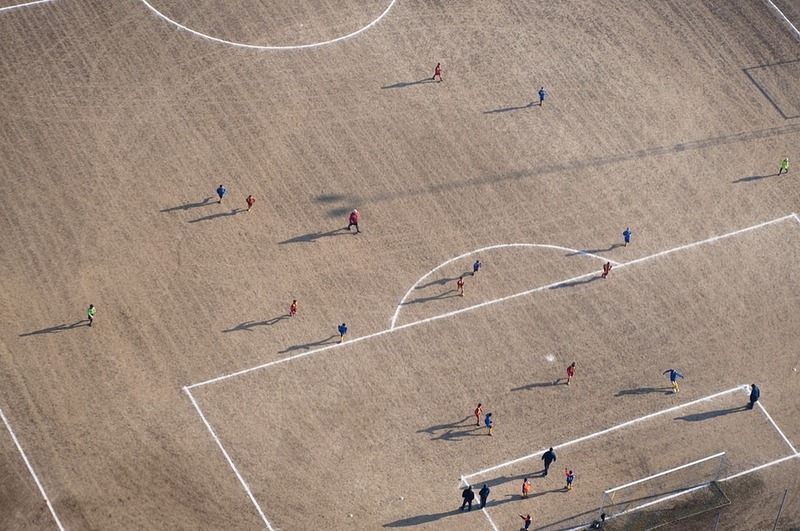 In every soccer game that’s played here, each team isn’t just defending its own goal. One side is defending the northern hemisphere, and the other side the southern hemisphere. Estádio Milton Corrêa is nicknamed Zerão, which means “Big Zero”, denoting the zeroth latitude, the equator. 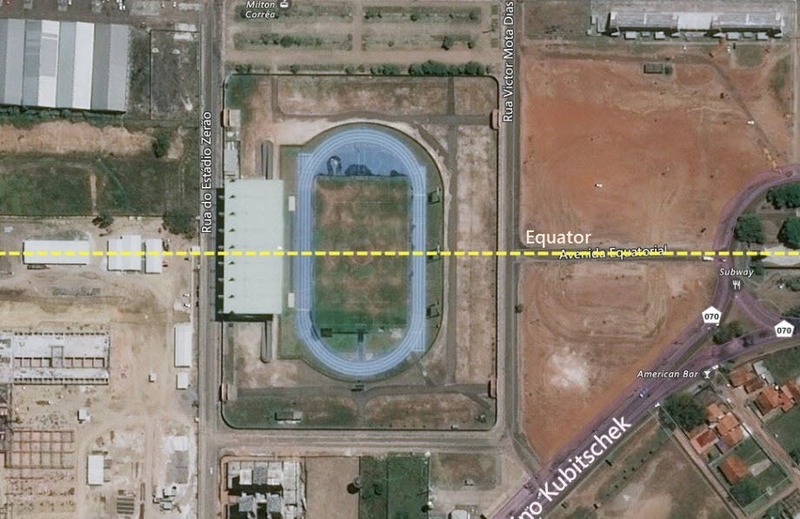 However, Estádio Milton Corrêa’s claim to fame is marred by a slight problem—it does not lie at the equator, at least, not by the WGS 84 geodetic datum. A geodetic datum is a coordinate system used to locate places on earth, the accuracy of which depends greatly on how well the shape and size of the earth, as well as the orientation of the coordinate system has been defined. Over the centuries hundreds of different datums have been developed, used and discarded as our knowledge of the earth’s shape became more and more refined. There are many different geodetic datums in use today, each one having a specific purpose. There are flat-earth models used for plane surveying, and complex ones that completely describe the size, shape, orientation, gravity field, and angular velocity of the earth. Position of the equator according to the Brazilian Geodetic System. WGS 84 stands for World Geodetic System, established in 1984. It is an internationally agreed standard used in cartography, navigation and in GPS. But because the earth is an imperfect ellipsoid, cartographers and scientists sometimes use localized datums that can give a more accurate representation of the area of coverage than WGS 84. For instance, the geodic covering of the British Isles can be better described by OSGB36, a geodetic datum, than WGS 84 does. Similarly, Brazil has its own geodetic system called Brazilian Geodetic System or SGB. When the pitch on the stadium, Estádio Milton Corrêa, was laid down, engineers used the Brazilian Geodetic System. In this system, the mid-field line runs exactly along the equator, but not according to the World Geodetic System 84. Position of the equator according to the World Geodetic System 84. If you were to stand on the mid-field line and take out your GPS device, you’ll not get a zero reading. You have to walk south until you are completely off the pitch, before your GPS device finds the equator. The stadium lies 2 seconds north in the World Geodetic System 84, in other words, entirely in the northern hemisphere. But don’t let the small technicalities bother you. Irrespective of which hemisphere the stadium lies, I’m sure some great football is played here.